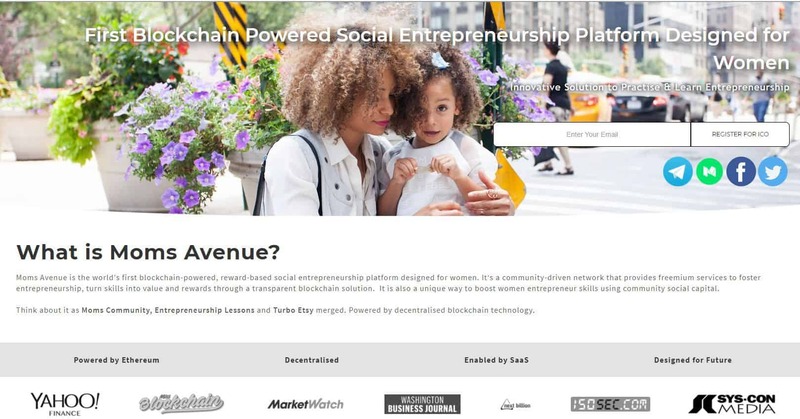 Moms Avenue, a reward-based social entrepreneurship platform designed for women, has announced its Pre-ICO upcoming in 2017 Q4. Moms Avenue plan to create a M.O.M. token in the Ethereum ecosystem and develop a transparent Blockchain-based reward system. M.O.M. tokens will flow among different category users of the platform, such as sellers, buyers, employers, entrepreneurship teachers and learners, freelancers, various services providers, and others. The Moms Avenue platform will deploy a Token Wallet, Virtual Utility Tokens, and Payments to one user-friendly solution. The team is currently preparing for its upcoming Pre-ICO later this year. The latest Blockchain technologies, creative solutions, passionate team and a successful Pre-ICO event will guarantee a realization of a revolutionary Moms Avenue platform. As the world is at the doorstep of the Blockchain disruption we’re still tackling the gender inequality and the lack of women participation in entrepreneurship and the crypto economy. There are two challenges for women to overcome – gender gap is closing yet too slow (37 percent of business owners are women); there are only 4 percent of women active in crypto markets (Coin Dance, 2017). Moms Avenue combines cutting-edge technology and an innovative reward-based business model to tap into the potential of female entrepreneurship and engage women into a Blockchain-based market. Moms Avenue will follow the social entrepreneurship concept with a plan to improve Decentralized Autonomous Organization (DAO) with Smart contracts. Compared to standard DAO, it will be oriented not only in decision making but also in community growth and profit re-investment. Thus, an entirely new social entrepreneurship concept will be created on Blockchain. Evelina Bajorune, an active mom of a lovely little daughter, came up with the idea of Moms Avenue. An experienced Project Manager envisioned a place where women could get rid of their fears, and get professional support and guidance to kick off their own businesses.